I received my undergraduate B.S. degree in Biology from Bloomsburg University in Pennsylvania in 2002. 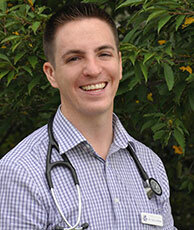 I graduated from Ross University School of Veterinary Medicine in 2006. The first 3 years of school were done on the island of St Kitts in the Caribbean with my final clinical year at Virginia-Maryland College of Veterinary Medicine (aka. Virginia Tech.) Living on a rock in the middle of the Caribbean Sea definitely had its ups and downs. One of my vet school highlights was traveling to South Africa for a two-week wildlife veterinary course. I made friends with an emu; micro chipped over 50 wild white rhinos and relocated zebra, wildebeest, and crocodiles. Talk about a once in a lifetime experience! You don’t fully know adrenaline until you are charged by a rhino in the wild! I have been treating pets in the greater Charlotte area since I moved here in 2009. (So happy to not deal with 6 feet of snow as I did growing up in NJ!) I treat my patients as if they were my own pets because I know what an important part of the family they become. I have 2 dogs – Rocco and Mr. Banks and 3 cats – Colin, Nikolai and Oscar. Our pets can’t tell us what’s wrong so I make it my mission to keep them healthy. My goal is to provide great medicine, surgery, and emergency vet services to your furry friends in an inviting environment with great customer service. Thank you for taking the time to explore our website and learn more about us. Now it’s your turn – stop by with both your 2-legged and 4-legged family members so I can get the opportunity to learn more about you. Contact us today to schedule your visit.